In the framework of different assignments, I regularly published books, exhibits, articles etc. HAVEMOS DE VOLTAR: We Have to Return. In 1992 I travelled with my old friend Paul Staal (with whom I worked first in Zimbabwe in 1980) to Angola, just after the Bicesse accords ("The small period of peace", as they used to call it in Angola). We made an exhibit on the then actual state of affairs that was shown in many diferent countries (USA, Canada, Netherlands, Belgium, UK, Portugal, Angola, etc.). The Portuguese version is larger and more updated. In Angola I trained, developed projects, evaluated and published (this book with a group of Angolan trainees). For the organisation Thesis, Managua. With Hans van Heijningen and Jose Pauw. For a PDf of the complete book click here. It is not easy to convey the economic reality of a country where the rate of inflation is three per cent a day - in Luanda the capital of Angola, prices, including food, double almost every month. Nor is it easy to write about development in a country that has not had a lasting peace for 35 years and in 1996, as we write, knows only a fragile cease-fire. But there is value in showing the rest of the world how Angolans living in poverty in the musseques, the shantytowns surrounding Luanda, survive the struggle against inflation and uncertain supplies of food, water and energy - in short, the struggle for life. This book shows how people are helping themselves through the current crisis in Angola. It refers very little to events and decisions at the level of national or international politics, nor does it speculate about peace and possible postwar developments. In this sense, it reflects the feelings of most Angolans living around Luanda, whose main preoccupation is merely to get by from one day to the next. Since 1961, Angola has endured one long destructive war. It began as an anticolonial struggle against the Portuguese and by 1975, the year of political independence, had turned into a war between liberation movements. Then, when South Africa began its armed raids into neighbouring countries, Angola became an international battlefield involving Cuba, the Soviet Union, the United States and Zaire. After the Cold War, the war in Angola persisted between the two remaining forces of the earlier liberation movements: Jonas Savimbi’s UNITA and the multiparty government, dominated by the MPLA, the former communist party. As a result of the Accord of Bicesse between the MPLA and UNITA in 1991, the economy was liberalised and free elections were promised. The elections were duly held in 1992 but, as readers familiar with Angola’s recent history will recall, UNITA lost the elections and so returned to war. In total, the United Nations estimates the death toll only during this period to be over half a million people, with more than two million displaced from their homes, 80,000 crippled and 50,000 orphaned. This is not taking into account the estimated half a million indirect deaths from hunger, malnutrition and preventable diseases caused by the warfare, mainly among children under five. Now, the country is on the brink of collapse, and the people are desperately looking for any form of recovery. Yet this need not be the case. Angola possesses enormous riches: large reserves of oil and diamonds, good fishing grounds. It also has fertile land and a climate suitable for producing coffee and other valuable produce. But this wealth potential has not been available to the masses of people fleeing to Luanda since 1961. Luanda is Angola’s capital and largest city. It is also home to between two and a half or three million people - no one knows the exact figure. Because it is one of the few safe places left in Angola, the city’s population has grown tenfold during the past 35 years, and by 20 per cent in the past three years alone. Yet, it has had almost no investment in infrastructure since 1975. Ngola Kiluanje (named after an heroic Angolan King who fought against the Portuguese in the seventeenth century) is one of the communes that surround Luanda. It is made up of industrial sites and shantytowns, home to an unknown number of Luandans and migrants from all over the country. It is a place where the vast A family of the musseque majority of people no longer have trust in politicians, neither in the government nor UNITA, the armed opposition. Both are fighting to make themselves master of Angola’s rich natural inheritance. The results of the economic crisis are seen daily in this unfortunate city, and what is more important, the results are felt every day by its inhabitants. I was introduced to Angola by Paul Staal, a Dutch consultant with a deep knowledge of the country. Together, we created the exhibition Havemos de Voltar (We Have to Return), before the elections in Angola in 1992. When I made my second visit in 1992 I met Rui, a volunteer at an urban upgrading project in a Luandan shantytown. In 1993, I asked him if I could spend a weekend with his family in their house, which I had not yet visited. His reaction was one of total disbelief. To the knowledge of Rui and many others, a white visitor had never slept in the shantytowns, which are widely considered black strongholds and dangerous to strangers. But he agreed, and so I became acquainted with the family. During my visit, I became especially fond of Ricardo and Teresa, his father and mother and the heads of the family. From this experience the idea arose to describe the development needs and potential of a city like Luanda from the point of view Introduction of its poorest inhabitants. Too often development policies and programmes have the perspective of a helicopter, hovering over and looking down. I am convinced that working from the personal perspective, which we have tried to take in this book, gives deeper insights. In August and September 1995 a group, consisting of Alexia Gamito, João Francisco da Silva, Pascoal Estevão, Vicente Albino Paulo (Genuíno), Jack Domingos Ramiro, and Victor Vunge was formed. Together we drew up a plan, divided the tasks, interviewed and photographed life in their shantytown - their musseque. Many in the group are new to journalism and this is their first product. 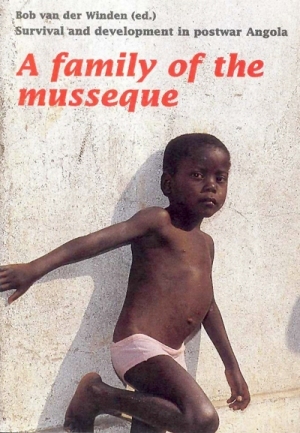 I wrote and edited the text of A family of the musseque in early 1996. In Chapter 1, ‘The setting’, we drive through Luanda, starting at the place where the first colonisers landed, a beautiful bay shielded from the sea by the peninsula called Ilha de Luanda. In an hour we arrive at the musseque called Ngola Kiluanje, where we meet the Ricardo family, who have lived in this area for almost 20 years. In Chapter 2 we describe one day in the life of the people who live in the small enclosed compound, which is called a ‘yard’, owned by the Ricardo family. We become familiar with the central characters of the book and try to imagine what abstract concepts like economy, development, war, democracy and gender mean for the woman in the market and the man in the street in Luanda. Everywhere we look, we see people struggling, we feel the heat and smell the odours. With members of the family, we walk through the area, following them through the economy in Chapter 3, their hopes for development in Chapter 4, local politics in Chapter 5, and the war in Chapter 6. In Chapter 7 we try to look into the future. In the epilogue we ask the family and friends to speak again and to tell us what they dream for the future. The ‘day in the life’ description in Chapter 2 is real, although it is not an actual day. It is a composite of typical routines and one not so typical event. We devised it from our notes taken over several weekdays in the Ricardos’s yard. Each day we would take time out to write down what people did, how they reacted towards each other, where they were going if they left and where they came from when they returned. We also interviewed most members of the family - these are told as flashbacks in Chapter 2, or as highlights in the following chapters. We are proud to be able to present this book, in which Angolan people, in their own words, express their feelings and show their daily life to non-Angolan readers. Finally I, Bob van der Winden, must stress that I accept full responsibility for the contents of this book. The Angolan team delivered a huge amount of valuable material in the form of interviews, pictures and articles, but the final selection and editing of this material is my work. Therefore, all views expressed, including any errors and omissions are entirely my responsibility. For the organisation TESIS, Managua. With Hans van Heijningen and Jose Pauw. …They form the most marginalized sector of children and youth among Managua’s urban population. Seen as garbage by many of the middle-class, and harassed by police and security guards, they find thousands of ways to survive. This book deals with the glue-sniffers of Managua, those children and young people who sniff shoemaker’s glue to get high. To write this book, we have researched the situation of these marginalized children and youth, and assessed their future outlook. In the first section, we meet a young couple - Pedro and Maria - and their families and friends. They all live one day at a time, and chaos is the most constant feature of their lives. Their lack of more or less stable homes, together with poverty, prostitution and theft, abuse and incarceration, alcohol and drugs, seem to be the basic elements of their lives. It is a story that includes many dark chapters, but in which happiness sometimes breaks through in a spontaneous and even volatile manner. In the second portion, we detail the living conditions of the Oriental Market’s outsiders in a more thematic manner. We look at glue as a drug, prostitution, the police and the legal system, and health services available to these young people. The third section examines the impact which state policies, the nation’s economic crisis and family disintegration have on the rapidly expanding number of gluesniffers, as well as the lack of comprehensive policies on the part of state institutions. In the fourth part, the role of Non-Governmental Organizations is covered, their interpretations of the social problems faced by the most marginalized urban sector, and some of their efforts aimed at prevention. Finally, we hear from the Director of TESIS (The Association of Health, Education and Social Integration Workers). Through offering this introduction to the world of gluesniffers, we hope to have fulfilled our commitment to increasing awareness among social and political actors who work with Nicaragua’s outsider youth. As two Dutch people who have maintained a relationship with Nicaragua for more than 15 years, we identify with the people and organizations which - under extremely difficult circumstances - continue to help the most vulnerable members of society identify viable options, as they struggle to survive. It’s still there, the rubble of Old Managua; the ruins, which were left by the great earthquake of 1972. They survived the dictator Somoza, and the governments of the Sandinistas and Doña Violeta Chamorro. And given the deplorable state of the Nicaraguan economy today, they will surely survive the government of Dr. Alemán. The old center of Managua is still a deserted wasteland. One still sees the remains of some old apartment buildings. Along the shores of contaminated Lake Managua is the old Cathedral. Rather than restoring it - and fearful of new tremors - the Catholic Church built a new one in another part of town. In a one-room hovel, standing alongside the Managua ruins, lives an entire family: a man, a woman and their five children. In the empty and hot Plaza de la Revolución, in front of the Cathedral and the National Palace, under the trees, people sell watches and cheap jewelry, and there is a food stand. A group of street children are killing time, sniffing occasionally from jars of glue. If you walk toward the center of town, past the González Cinema, you’ll see a six floor cement structure without any facade or side walls. Some families have marked out their living space with sheets of plastic; they climb to their homes on a wooden stairway. At the Dupla Norte intersection - one of the main roadways that perpendicularly cross this part of the city – you see people (including lots of children) trying to sell all sorts of items to drivers: newspapers, bags of cold water, cloths for cleaning cars, whatever you want. On the other side of the street sits El Plantanito (The little Plantain), a glue-sniffer who is once again clean, taking care of some goats in a small field. He works for someone a little better off than he is. He’s sitting on a green rock, in the shadow cast by the shell of a building. “The Savior of Central America” is written on the wall in huge painted letters. A group of girls - addicts and prostitutes - sing children’s songs, led by two educators from the Association of Health Education and Social Integration Workers (TESIS), an organization that works with the street children and drug addicts of Managua. The owners of the stalls next to the small library of the Luis Alfonso Velázquez Park watch them in fascination. Martha and Henry, the TESIS educators, do more than sing with their group. They also offer advice about how condoms use can help avoid venereal diseases. TESIS - with funding from SKN, Kinderen in de Knel, NOVIB, MEMISA (Dutch NGOs) and the Dutch Embassy – also distributes condoms to girls working as prostitutes in Managua. Most of them are glue addicts. They sniff it by sticking their noses into glass jars of shoemaker’s glue and breathing in deeply. They get a strong high from the glue. Fernanda is there with her son Simon, Marisol (who just got out of jail), Cristina La Cachorra (The Puppy), and Dinora. The talk is over and the group is heading to the Oriental Market. They stay in La Casita (The little house), which is nothing more than ruins, right next to the Market’s garbage dump, where no one would choose to live. They cross the street, engaged in animated conversation, and pass by the huge Bank of America - one of the few buildings that survived the earthquake - that is now home to the National Assembly and the Ministry of Finance. Surprisingly, the area surrounding the Presidential and National Assembly buildings is filled with thousands of houses among the ruins. Less than fifty meters away, these houses are no more than precarious huts and are the homes to enormous numbers of people. Fallen buildings house small shops (“All brands of mufflers”). Occasionally a better cared for home or playground may be found among the ruins (like the ‘Billy Stewart’ Child Care Center). It is the typical Managua image: small cement houses, mostly one story, with zinc roofs, and chaos everywhere. In an open field, a monstrous lone beacon symbolizes peace. It is a monument that was built over truckloads of guns, collected during Doña Violeta Chamorro’s government. We arrive at the Kathin Supply House, one of the Oriental Market’s many entrances. The market currently occupies an area of some 60 hectares - expanding over time as the merchants gradually took over more and more land - and is home to close to 20,000 small shops. The Kathin sells wholesale to smaller merchants who operate both inside and outside of the Market, selling things like eggs, chickens and cheese. Along the street are huge piles of fruit. Merchandise brought by trucks is unloaded by hand carts; a human ‘carrier’ later distributes it throughout the market. From that point onward, vehicles can no longerenter the market. Buses from Masaya also unload here, leaving merchants and their produce close to the Market where everything is for sale. Two young boys are washing one of the buses. The Rubén Darío School complex is located on the next street, where many of the merchants send their children. When they don’t need to work for their parents, schoolchildren play in the muddy streets. There is a clear difference between this school and the Baptist School, located a few blocks away. It is one of the schools where the city’s more wealthy inhabitants send their children, and it is separated from the agitated market life by tennis courts and football fields, protected by huge hurricane fences. We pass Calvario Street, and the church that goes by the same name. There, the Sisters of Charity - the same order as Mother Theresa of Calcutta - offer help to the gluesniffers, providing medicine, clothing and food for those who need it. Here, right next to this source of help, one group of glue-sniffers (addicts) have installed themselves almost permanently. La Cachorra doesn’t get along well with her counterparts from the Calvario neighborhood. She passes them quickly, shouting insults. “They’re not with us, they’re from the Calvario. Sometimes we fight with them,” she adds. Marisol points to an open lot with some twisted pieces of plastic waving in the breeze. “That’s one of the places where I receive my clients,” she says, laughing. “Want to join me?” Fernanda causes a great stir when she makes a face (mutilated by burn scars) and professionally pull a condom out of her bra asking, “Want to buy one?” The street scene becomes more congested: giant trucks with Coca Cola logos are unloading onto carts that are pushed into the Market. Huge amounts of tangerines and other citrus fruits are brought directly from La Concha (the popular name for San Juan de la Concepción), about 30 kilometers away. Car tires fill the streets from one sidewalk to the other. Huge sacks of flour are piled into a wooden cart that has two old bicycle rims without tires for wheels. The 107 and 158 buses from Ciudad Sandino depart, honking their horns among the multitude that keeps growing. The buildings become more dense as well, so that there is always a roof overhead. The heat begins to suffocate. Inside, under the roof of the enormous market building, the stoves from dozens of food stalls - where a complete dinner costs ten cordobas (US$1.00) - let off a scorching heat, which becomes unbearable. After the drinks, Roberto takes us to La Casita. The bananas can wait an hour or so. All of a sudden, two policemen run by and grab a boy holding an iron by his collar. “That’s El Piojo (The Flea). They caught him with his hands in the cookie jar,” whispers Roberto. After twisting him around, one of the cops yells, “Do you want to go to the station?” The Flea falls down, and then gets a punch from the other cop. The police disappear in the direction of Station IV with the iron in hand, but leaving the Flea behind. There are dozens of people in the Market garbage dump, browsing through it in the hope of finding something that may still be of use. Among them are a group of gluesniffers from La Casita, who consider the dump as part of their territory. They live with another 35 boys and girls on the bottom floor of a destroyed building, next to the dump. This is the place they call La Casita - the Little House. Older derelicts, who drink rather than sniff glue, live upstairs. Glue is the drug used by the kids on the bottom floor. In shoe repair shops, the jars of glue cost 2-3 cordobas, depending on how much glue they contain. The inside of La Casita is completely empty. There is nothing more than dirty cement and graffiti-covered walls; “Jesus Loves You,” they announce. Pieces of cardboard serve as beds. Some kids inside are off in space. They can barely utter a few incomprehensible words, and look totally lost as they inhale from their jars. Others are more alert and look for cigarettes. When one of the older residents from above arrives and tries to drag a girl along with him, a fight breaks out and the boys try to stop him. We get out before knives are drawn. Here, life is cheap. Just recently, the undisputed leader of the La Casita group - La Loba (The Wolf) - was stabbed to death. Outside, we run into Maria - Roberto’s sister-and Veronica. They’ve heard about the fight and they’re scared. Obviously, they’ve come because they’re curious, since they haven’t lived in La Casita for some time. Maria, 17, is seven months pregnant and lives with her boyfriend Pedro in her mother’s house in La Tejera (The Brickyard) neighbourhood. Her cousin Veronica, 14, also lives with them, with her boyfriend Jaime. The two girls, who have been sniffing glue for years, just got back from the ‘Popol-Na’ clinic where they were taken by Omar from TESIS.